We just arrived back home from our visit to the Family Hope Center (FHC) for our son Aaron’s (age 7) first six month reevaluation. The reevaluation process is a repeat of the initial evaluation–two days of intense testing and assessments on all of his neurological pathways to determine his neurological age and his percentage of function. At our first visit in November 2014, it was verified that Aaron was neurologically 45.4 months (3 years 9 months), resulting in functionality of 54% with a severe brain injury. We received a robust therapy program that we were charged with leading him through at home. Then we come back every six months to check his progress and tweak his program to move forward. 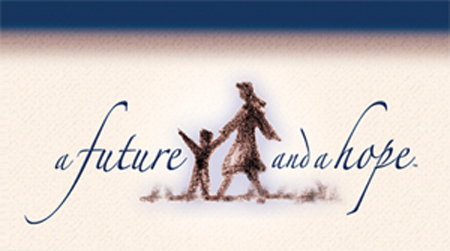 To see an outline of what the therapy program looks like, please read my post Our Journey of Hope–The First Months. We had difficulty implementing the entire program. The first 3 months was a huge struggle. Aaron simply did not want to do any of it. I don’t blame him. I wouldn’t want to do it either. It’s physically, emotionally, and mentally demanding. It took time to figure out how to make it work. After fighting and struggling nearly everyday for more than 3 months, one day my husband simply gave up. He told Aaron, “I don’t know what do say to you anymore. I give up.” Then he went into his office. About 45 minutes later Aaron came into the office, “Daddy, I did it.” He did all of his crawling all by himself. From there, Aaron took ownership of his program and scheduled specific time each day to complete his crawling and creeping and has been consistent since mid-March. Then for the last couple of weeks before our trip, Aaron was able to complete 80-90% of his program each day. The FHC team explained that it often takes a year to get into the groove of doing the program consistently, and from participating on the parent support Facebook group, I realized that NO ONE was able to do everything everyday. However, there were all sorts of encouragement that even doing some of the program would yield results. We did experience a major breakthrough in the beginning of April. Aaron regularly had 1-2 meltdowns everyday. These were usually caused by a disruption in routine. He would scream, yell in a high-pitched voice, throw things around the house, etc. Additionally, Aaron kept “messing up his words,” having trouble articulating his thoughts verbally, and this was very frustrating for him. So much so that he would angrily stop talking. My husband called the FHC, and they suggested that we remove all fruit from his diet so that he eats only meats and vegetables at every meal. Long story short: We followed their dietary directions, Aaron went through one day of detox, then 5 days later, my husband realized that Aaron was no longer messing up his words, and Aaron realized it too! In the entire month of April, he only had 1-2 meltdowns, rather than 1-2 meltdowns per day. He knows he’s getting better, and he knows this most recent improvement was due to removing fruit, and he doesn’t even ask for it. Often, my husband and I discussed our perceptions of Aaron’s improvement. However, we knew we could not be objective, so we were looking forward to some concrete objective numbers to determine whether or not he was progressing. What they like to see is a gain in neurological development (measured in months) to close the gap between his neurological age and his chronological age which will boost his percentage of function. We arrived at FHC on a Wednesday. We were one of 6 families there. The director explained the schedule, and we got started. We began by meeting the nutritionist (who is also an M.D.) to discuss his diet, then we met with another doctor to go over his general health. After that we met with the co-director, Carol, to begin Aaron’s neurological evaluation. She tested Aaron’s vision (not just a chart like we’re used to, but how his brain perceives what he sees, and how his eyes are tracking). His tracking improved, but he still doesn’t track smoothly (which is important for reading), and when she had him follow an object with his eyes in a circular pattern, he always lost sight of it in the upper left. Then she moved onto his hearing, and he had some slight issues with identifying where various sounds were coming from, but a definite improvement from last time. Then for tactile, he had to identify heads or tails on a coin by touch. Last time he never got it right. This time, he never got it wrong!! She tested his ability to smell. Again, there was an improvement, but there are still issues with this. He does not like the smell of anything–lavender, lemon, cinnamon, vanilla; however, the one smell he kind of tolerated was black pepper. One thing I notice is when introducing a new food, he will declare that it smells terrible but tastes yummy. There’s a disconnection there, and we have some work to do to help him in this area, which is part of his limbic system and controls his emotions. Aaron gained 19.7 months in neurological function…that’s more than a year and a half…which is a 303% improvement! He progressed from 54% brain function to 72.8%, and the level of his brain injury moved from severe to moderate. You may ask, what are the improvements we’ve seen? Well, Aaron is much happier and much more social. He plays very well with his younger sister, and joins in with playing with kids at church. Aaron participated in a home school co-op, and my husband felt comfortable enough to leave him in the class while he attended the parent encouragement sessions. Reports were that Aaron behaved and participated with the class very well. He has a much greater ability to articulate his thoughts, which is a relief to us, because before we were at a loss for what was really going on with him, now he can tell us! It was really fun to have the FHC team read through notes from our previous visit and discover that issues that were monumental then are nonexistent now. The second day was a series of appointments with various team members to develop his new therapy program: sensory, breathing, mobility, and learning/social. We are now home with a tweaked therapy program, and ready to move forward. Our biggest issue right now is Aaron’s rigidity with routine and schedule. Aaron schedules every minute of the day, and completely falls apart if there are disruptions to that schedule. It is very difficult for our family, and my husband and I would like to be the ones to make the decisions rather than our 7 year old son, and we’re looking forward to this issue resolving. Our conclusion is that our labor is not in vain. We know Aaron has a future and a hope (Jeremiah 29:11). DISCLAIMER: The program outlined in this blog post was prescribed specifically for my son by the Family Hope Center‘s team. I wrote some of the details for friends and family who wanted to know what we’re doing. I strongly caution anyone from trying to implement these therapies without explicit instruction from the team at the Family Hope Center. This program does work, so, please contact them and make plans to attend their 3-day parent conference. We just passed the three month mark since beginning our Journey of Hope and the program outlined by the Family Hope Center. We are seeing results, so although the program is demanding, we are motivated to continue. My husband, Bruce, essentially put his life on hold so he can completely focus on working with our son, Aaron, while I work full-time. Reflex bags–40 times per day. This stimulates deep breathing reflexes which increases blood flow to the brain. Once the bag is covering his mouth and nose and we notice him beginning to take rhythmic deep breaths, we set a timer for 30 seconds, then we wait at least 5 minutes in between. Aaron finds this very pleasant and calming. Crawling (commando style)–300 meters (working up to 500 meters). We do this on a hard smooth surface, so he glides across the floor. This is the therapy that Aaron resists the most, but he can get the distance done in less than 30 minutes if he focuses. This activity stimulates the brain stem, and there are important functions in the brain and reflexes that didn’t develop correctly in Aaron because he didn’t crawl enough like this as a baby. Creeping (on hands and knees)–600 meters (working up to 1,200 meters). We laid out a path of foam tiles in our basement. Back and forth; back and forth. This stimulates other areas of the brain stem that are vital. Listening to a special music CD–30 minutes per day. This helps him filter sounds. 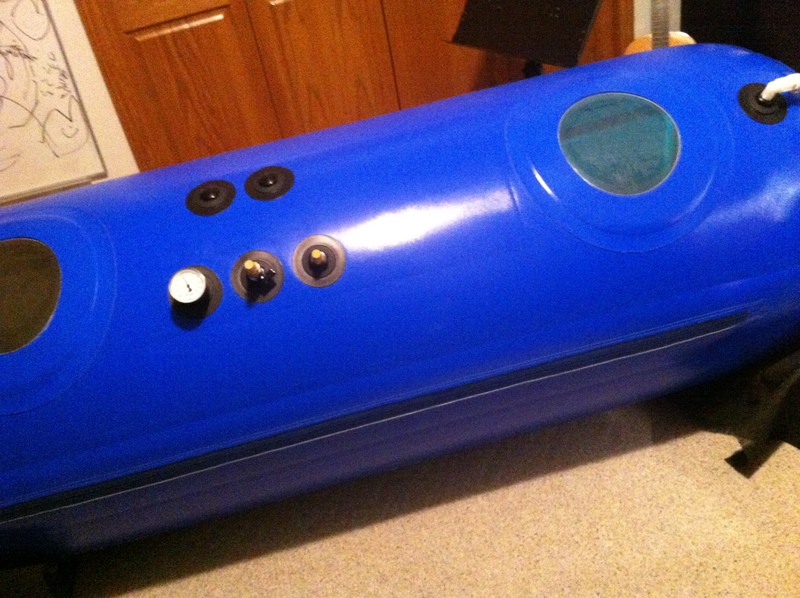 Hyperbaric chamber–60 minutes per day. 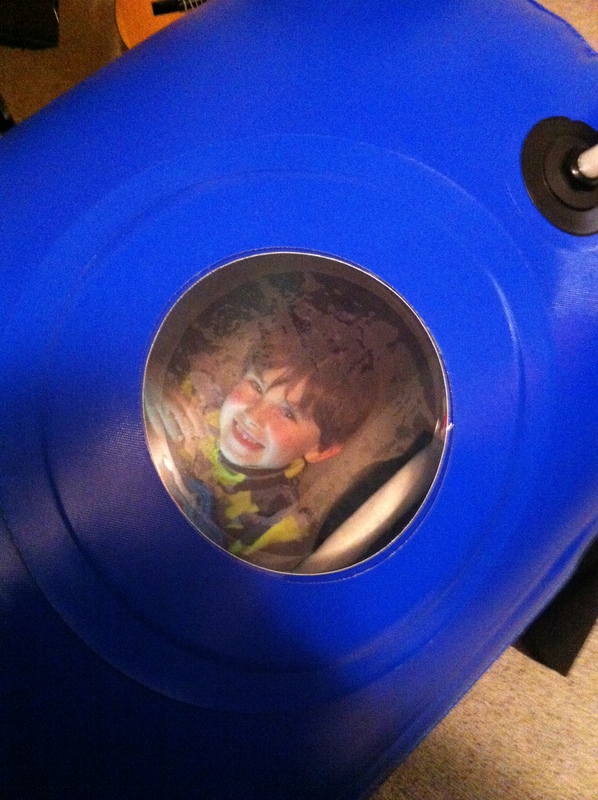 By far, Aaron’s favorite therapy. 4 pounds per square inch of pressure increases blood flow and has been proven to grow new tissue. We do this at the end of the day. He goes to bed right afterwards and sleeps soundly through the night. Tactile therapy (smooth and rough on skin)–10 times per day. We still need to implement this. Social behavior and boundaries (reduce repetitive play and sit quietly in church). We notice a definite reduction in repetitive play, and we need to work on the “sit quietly in church,” though he did sit with me for 10 minutes last Sunday and did great! Education (building vocabulary and language skills as a foundation for social communication)–We are seeing significant improvement with his social skills. He carries on wonderful conversations and joins in with games and activities with other children. In addition to all of this, Aaron takes karate lessons twice per week and weekly piano lessons. Aaron also has a sister, Naomi, who is in pre-Kindergarten and involved with dance lessons. Bruce takes karate three times per week and is involved with prayer meetings and worship gatherings at our church. I work full-time, and I’m training for two half-marathons this year. We lead a busy and full life. Our next milestone will be Aaron’s re-evaluation at the Family Hope Center at the beginning of May. They will repeat all the tests they did in November, then adjustments to his therapy program will be made, and we continue on.